haocs_885sd has no other items for sale. Item received in perfect condition and in a timely manner. A+ Seller! Shipped Fast! As Described! Works Well, Thanks! Great seller! Super fast shipping!! 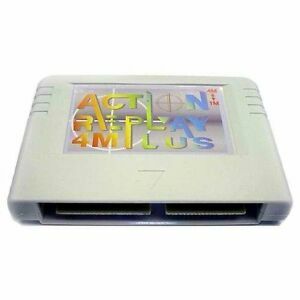 Action Replay Plus for the Sega Saturn is a special 4mb/1mb, game saves cheat device compatible with most Sega Saturn. Such as Japanese and American. Because it is definitely worth the money. I recommend everyone who owns a Japanese Sega Saturn console to buy this Action Replay Plus. Not only for its cheat device, but also for its back up memory and it also a 1mb/4mb ram. So the games that require it such as Vampire Savior as well as Samurai Spirits 3 and 4 can read the 1mb/4mb as well. No need to buy a separate 1mb/4mb ram. Because this particular cartridge, the Action Replay Plus does it all. It compatible with all Sega Saturn consoles, including the North American version. Beware not to buy the Game Shark cartridge. Because I once bought that in order to use it on my Japanese Sega Saturn. But unfortunately it doesn't work. So I have to return it. Yet again, the Game Shark also works like an Action Replay Plus. And the Game Shark version which I heard only works for the American Sega Saturn not the Japanese Sega Saturn. Last of all, this Action Replay Plus is definitely worth the buy. Once you start the Sega Saturn, it will automatically take you to the cheat device screen and it is also in English. A worldwide cartridge. This is a non-Sega produced product that functions as a RAM expansion, Memory Card, and GameShark. It also allows any Sega Saturn of any model to play games from any region. That said, this is a cheaply made product and is difficult to recommend on the basis that it is radically inconsistent, and if these cartridges malfunction, they are almost impossible to repair. The pin connectors are cheap and become damaged easily, my Saturn initially had a great deal of trouble recognizing the fact that this was even attached, and Saturn games don't directly recognize this as a memory card. To copy save data to this card, one needs to go into the Saturn menu, not the Action Replay menu, and copy the save data manually from the Saturn to the Action Replay. I've heard that this is very unreliable with the preservation of save data and may regularly wipe save files. All of that said, this is best product that allows the bypass of region encoding, on account of its ability to increase the RAM of the system. On the basis of strictly bypassing region encoding, I would tentatively recommend this, but on any other basis I cannot recommend. If you're interested in a memory card or a GameShark, go elsewhere. The action replay does exactly what it says it does. Only problem, they don't last too long for an electronic device. My first one lasted a whopping 7-8 years. In comparison, my original NES is over 30 years old and still kicking. My family's original Atari 2600 still works after 40 years (it sat in the attic for at least 25). Moral of the story: they don't make stuff like they used too. This product does exactly what it is intended to do. It is an import game Booter a 1m or 4m RAM cart and a memory cart. Problem I know most will have when using this for first time tho....its a back up memory cart not a actual memory cart. To use this you need to copy flash memory saves to this so in case your flash memory battery dies ypu have the game saves backed up on the action replay. Simply re copy the game saves to flash memory and voila. Great memory expansion, allows me to play import games, love it! !